By David Ponce on 09/12/16 • Leave a comment! I firmly believe that The Dark Knight was one of the best movies ever made. Aside from the late Heath Ledger’s legendary performance, the movie was bursting with amazing elements, like its soundtrack, its complex but rich storyline, and it’s remarkable vehicles. 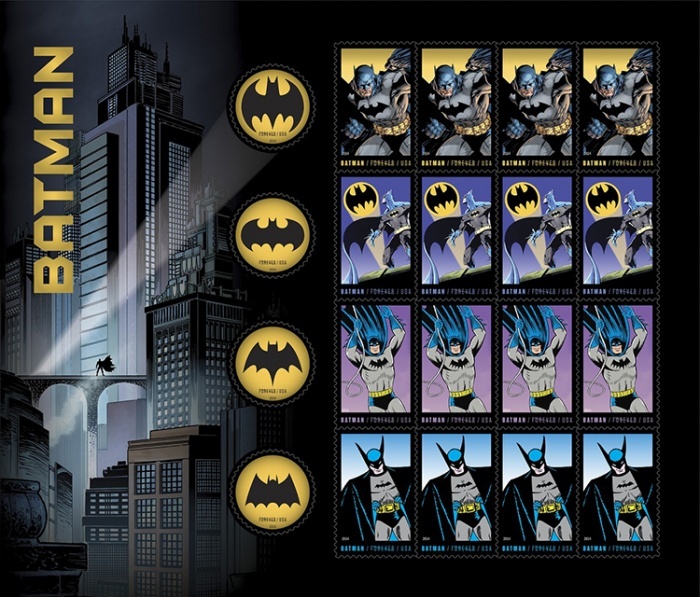 One of these, the Batpod, is now up for auction. It’s one of six such bikes that were built for the film. This incredible vehicle features a custom-made chassis with 31″ Hoosier racing tyres and a Honda 750 engine. Fibreglass body panels finished in metallic grey paint cover the bike’s engine and handlebars. A pair of cannon barrels made of plastic, resin and fibreglass are secured at the front of the vehicle, and a laser targeting unit is fitted above the right hand grip. A radiator and hydraulics are fitted behind the saddle, and the braking system is operated by controls on the left handle and the right pedal. Black foam padding is installed on the body, saddle and knee rests for comfort whilst riding. We don’t expect you to buy this and ride it around or anything; we’re not even sure that’s legal. 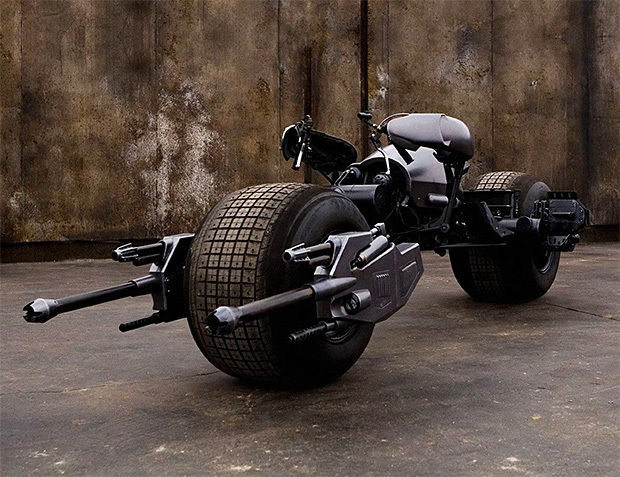 But for anyone looking to own a piece of movie history, the Batpod is expected to fetch somewhere around £60000 – £80000 ($80,000USD – $105,000USD). Artists make pretty things; we get to look at them, say “gee whiz, look at that”, and then once we’re done, we just move on. That’s what we’re expecting will happen when you read about French artist Christophe Guinet’s work here. 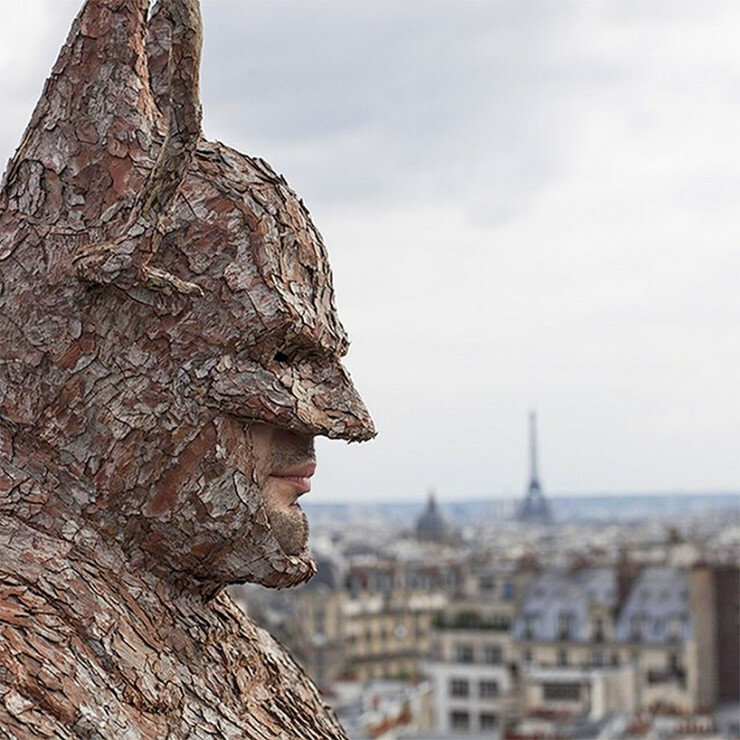 It’s a Batman suit made from tree bark, and well, it looks pretty neat-o. 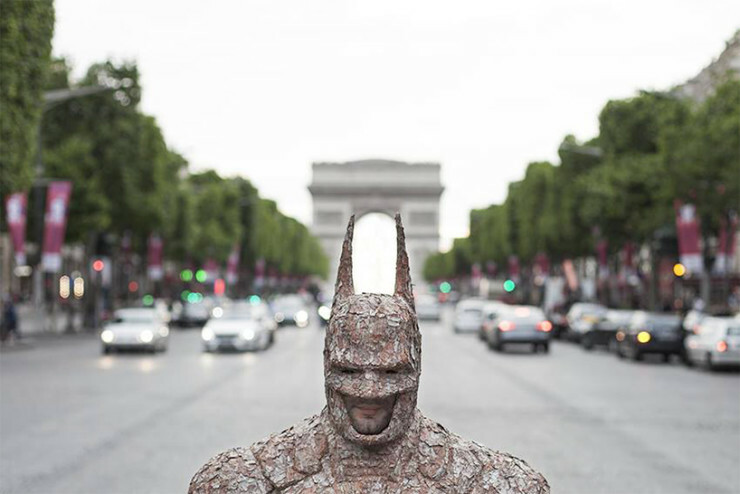 Together with Warner Bros. France and the Splendens Factory, the artist has designed the iconic batman suit primarily out of tree bark, vegetal moss, lichen and fungus. A foam mold of the batman suit and helmet has been carefully wrapped and covered in layers of tree bark, forming the suit’s distinctive pointed ears, opening for the mouth and nose, and defensive shoulder covering. Why? Apparently it’s Christophe’s thing, to appropriate plant life and create familiar objects. We suppose that in art, that’s as good a reason as any. By David Ponce on 06/11/15 • Leave a comment! Look at that crappy office chair you’re sitting in right now. Just look at it. It’s… well, it’s just a chair, right? Haven’t you ever asked yourself “why isn’t this office chair a superhero chair?” You should have, friend, you should have. 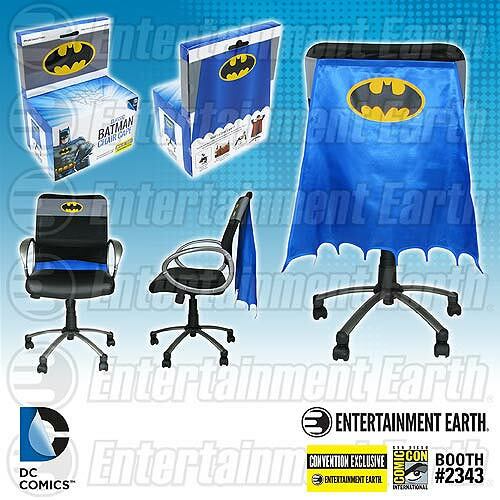 Because it turns out now it can be, thanks to the Batman Classic Chair Cape. 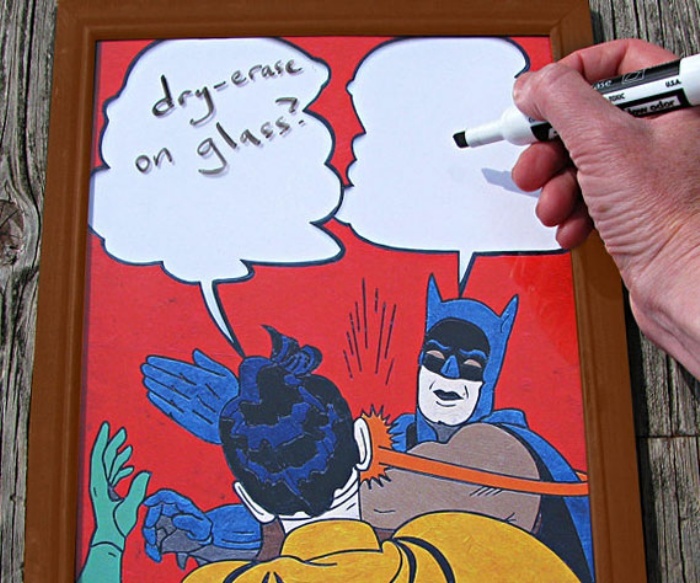 This wonderful novelty accessory is being made by Entertainment Earth, and first sold at the upcoming San Diego ComicCon. They’re making 2,400 of the things, and if any are left after the show, they’ll sell them to any of you who pre-order one now. These capes are 24-inches long, and should fit just about any type of chair. And we imagine that if they’re successful enough, it’ll be just a matter of time until you find them in other superhero varieties. It’s a very reasonable $25. By Hazel Chua on 10/08/14 • Leave a comment! Real men wear pink…and plush slippers. 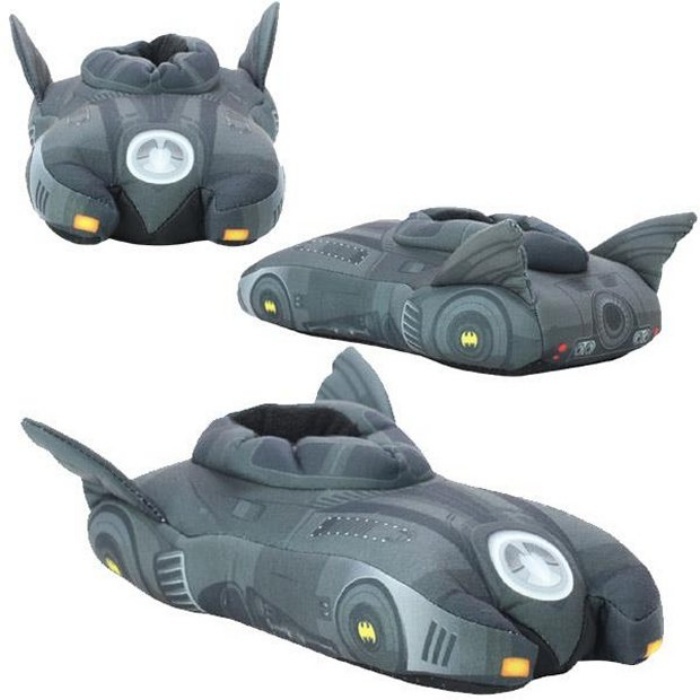 Okay, so I made the last part up, but who can resist these adorkable Batmobile slippers? I’m sure even Christian Bale can’t. They’re fashioned after the Batmobile featured in the 1989 Batman movie. 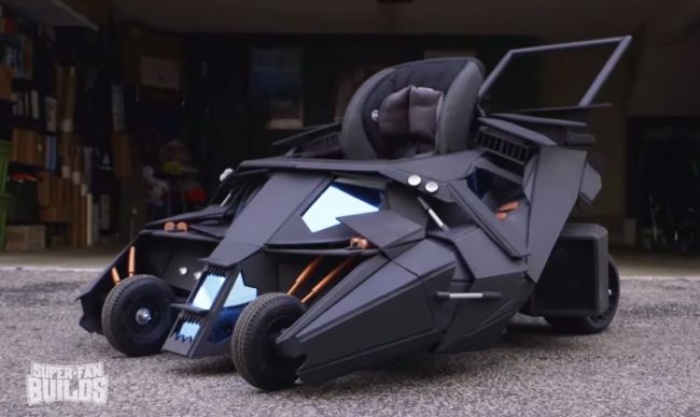 Granted, it’s not as sleek or tech-heavy as the Batmobiles of the recent past, but the Dark Knight’s 1989 ride is easily one of the most recognizable. The best part? They do just what they promise to do: keep your feet warm and comfy. The Batmobile slippers are currently on sale and you can get your very own pair for just $16. By David Ponce on 09/09/14 • Leave a comment! 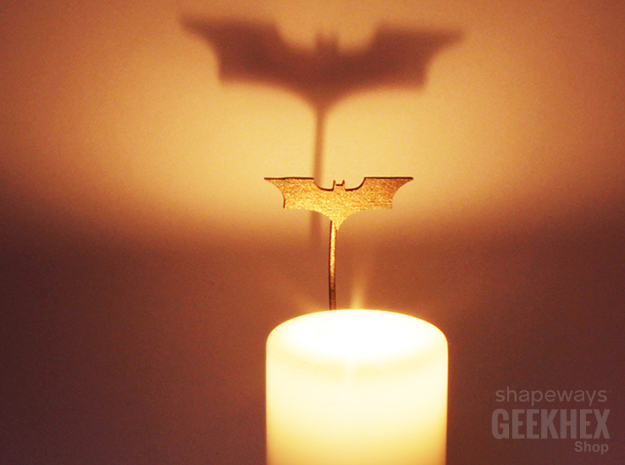 You’re looking at a 3D printed accessory that sticks onto the side of a candle, and projects a Batman shadow onto a wall nearby. 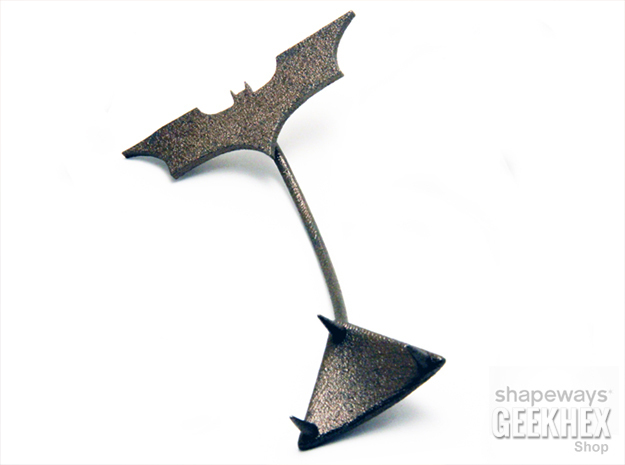 It’s neat, costs $35, and comes in 4 different shapes, depending on which movie version of the logo you prefer.